Next application period: Applications for the Award 2019 will be accepted from 1st September until 31st December 2018. Young academics (≤ 35 years at submission) with a high interest in Neuro-Urology and keen to pursue a career in Neuro-Urology. How to apply for the Swiss Continence Foundation Award? When applying for the Swiss Continence Foundation Award please save the date of the International Neuro-Urology Meeting and be sure to be available at the meeting. 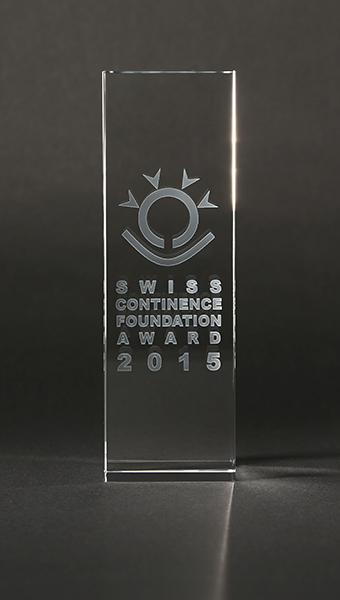 The Swiss Continence Foundation Award can be only awarded personally. What happens with the application? All applications received until the deadline will be reviewed. The best applicants will be invited to personally present their study during the “The future in Neuro-Urology” session at the annual International Neuro-Urology Meeting in Zürich, Switzerland. Presentation time will be 7 minutes followed by 10 minutes discussion (only PowerPoint presentations will be accepted). Who decides on the awarding of the Swiss Continence Foundation Award? An award jury of renowned international experts in Neuro-Urology will decide on the best contribution. The jury will not only include the abstract itself in its judgement but also the presentation of the abstract and the following discussion during the “The future in Neuro-Urology” session. The final decision of the Swiss Continence Foundation Award jury will be announced during the Gala Dinner of the according International Neuro-Urology Meeting. When and how does the award winner receive the Swiss Continence Foundation Award money? In order to receive the Swiss Continence Foundation Award money of 10’000 CHF, the award winner needs to publish the study of the presented and awarded abstract within the next 2 years in a pubmed listed, peer-reviewed journal. The awarding of the study with the Swiss Continence Foundation Award needs to be declared in the acknowledgement section of the manuscript. The accepted article needs to be sent to info@swisscontinencefoundation.ch with the bank account details of the award winner. If these conditions are not satisfied, the award money omits. Each award winner of the Swiss Continence Foundation Award will become member of the Swiss Continence Foundation Award Alumni Circle and will be invited to all future International Neuro-Urology Meetings as guest of honor. The awarding of the prize is determined by the jury's decision. The jury is appointed by the Swiss Continence Foundation, its decision is final. For the entry of their contribution to the award the participants comply with the application and awarding criteria.